Is there a more sinister horror movie weapon in the pantheon of horror movies than the billhook? Many people don’t know what that is (including the authors of this site until very recently). The dictionary definition of a billhook is as follows: “a tool with a sickle-shaped blade with a sharp inner edge, used for pruning or lopping branches or other vegetation.” There’s also the very similar reap-hook (pictured above in the hicksploitation / Pennsylvania Dutch-sploitation Children of the Corn, which we covered on the Really Awful Movies Podcast). According to the book, A History of the Garden in Fifty Tools, it’s close in kin to the Malay panga, the Cuban machete, the German forester’s heppe, the Italian roncole…author Bill Laws says “it’s more likely to be found in the hands of a butcher than a gardener.” How true that is, for our purposes here. Bottom line: they’re scary and deadly. Why? It’s that curved end. Curved weaponry are almost always more sinister than straight-edge blades in horror films. Case in point: the incredible use of the razor-sharp metal hook by the Berlin coven in the re-imaging of the Argento classic, Suspiria. Mario Bava used one to terrific and terrifying effect in his incredible A Bay of Blood. (In fact, they’re common enough they didn’t even make it into our book, Death by Umbrella! 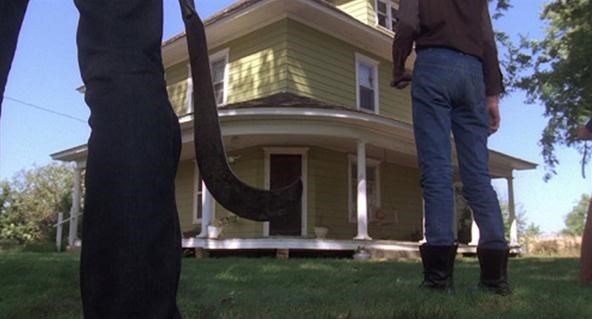 The 100 Weirdest Horror Movie Weapons). In evolutionary biology, a phylogenetic tree shows physical or genetic relationships among species. And many gore-hounds forget that proto-slashers Black Christmas and Halloween share a common ancestor: A Bay of Blood. In 1971, Mario Bava might very well have birthed the first truly modern horror film. A Bay of Blood not only has all the hallmarks later associated with the genre — the dizzying camerawork, the killer POV, and the heavy breathing — but it also suffered the trappings many of these films would later follow: budget cuts, multiple titles, a harried production schedule, scene settings far from ideal, “teens” who look north of 30 years of age, and impromptu technical improvisation (Bava used a toy wagon for tracking shots). Cheap and cheerful, Bava nonetheless retained some of the magic that made Black Sunday and Planet of the Vampires so memorable, and created wholly unique, and yes beautiful, bloodletting. 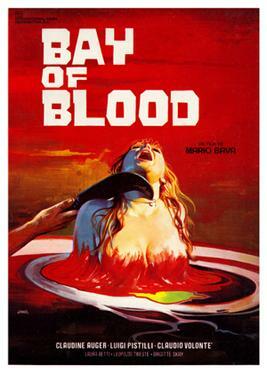 With akimbo angularity, shimmering waters, rustling foliage, and truly Italian interior design sensibilities, A Bay of Blood is a truly remarkable visual banquet. In the film’s opening stunner, a countess is strung up with a rope, the clicking of her wheelchair wheel turning ever so slowly. A figure emerges out of the darkness to investigate…and soon, he’s dispatched with shiny blade. It’s a scene that shows just how much can be done with a director in thorough control of his craft. Turns out the grand (and very dead) dame possessed a valuable, coveted piece of lakeside property abutting the title bay. And a scheming realtor and his girlfriend had designs on it. But not all is as it seems. A group of four young people begin to explore the property, which appears abandoned. 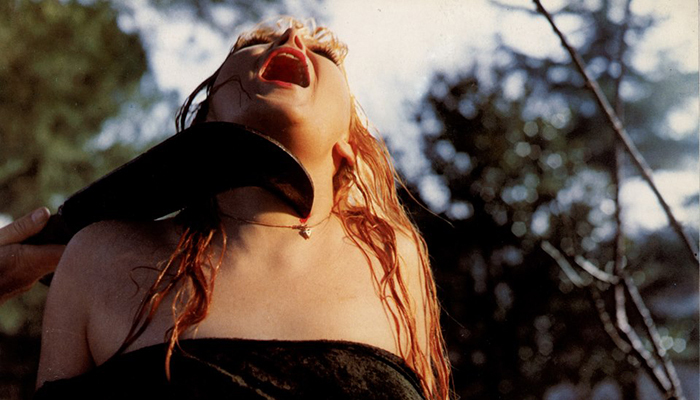 Slasher fans should recognize just how much Bava inspired the Friday the 13th series. There’s Bobby’s billhook demise (pictured) and a Baconian skewer pre-Kevin Bacon. However, unlike the post-coital dispatching we’ve come to associate with 80s slashers, Bava seems to revel in the mid-coitus kills, sexualizing them. It’s an interesting and jarring thing to behold for those of raised on domestic horrors.